The Celestron PowerSeeker 50 AZ Refractor Telescope may be just the thing to get absolute beginners or children started with telescopes. If they haven’t had any kind of astronomy experience with any kind of optical tools and instruments, this Celestron Powerseeker telescope may just be the best way to get started. Sometimes, in the area of amateur astronomy, where starting off with a powerful and complex tool is likely to set a standard that will be unlikely to be topped too soon, seeing the passion dissipate, rather than increase sequentially with every addition. The perfect way to ensure a long-life passion for astronomy is to have the technology match the knowledge one has for it, rather than try to force it. And the Celestron PowerSeeker 50 AZ Refractor Telescope is a great first step towards the stars: even if it’s one of the simplest and cheapest Celestron Powerseeker telescopes, the quality of the Celestron optics is an institution in itself. What is the Celestron PowerSeeker 50 AZ Refractor Telescope? The Celestron PowerSeeker 50 AZ Refractor Telescope is one of the most inexpensive products Celestron telescopes have to offer, being an openly entry-level piece of equipment, fit for a child or novice enthusiast. The Celestron PowerSeeker 50 AZ can be used for both astronomical observations, offering good views of the moon geography and planets, as well as terrestrial viewing. Indeed, weighing less than 2.5 kg and having a light aluminum tripod that stands at about 150 cm tall makes this a great tool to carry with you on trips where nature observations are possible. That means this Celestron refractor can actually function pretty well as a nature scope or a sitting scope as well. Additionally, the Celestron PowerSeeker 50 AZ Telescope is incredibly easy to set up and use even for someone with no experience in using telescopes. This quality makes it more likely that this Celestron refractor telescope will be a gift that will actually see use, even in the case of a beginner. Easy to use. The Celestron PowerSeeker 50 AZ Refractor Telescope is the telescope equivalent of the point-and-shoot camera, with little to no knowledge of optical instruments being required in order to use it. 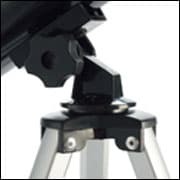 It only needs minimal set-up and can easily be taken down and up again, with no tools involved, making it one of the best refractor telescope for absolute beginners. Small and light-weight. It might just be the lightest Celestron telescopes for sale, being an obvious choice for the sort of telescope you put in your backpack when you’re about to climb to the top of a mountain. Dirt cheap. 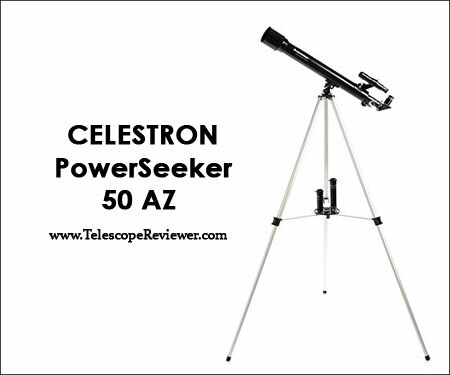 The Celestron PowerSeeker 50 AZ Refractor Telescope price stands at $49.95 plus free shipping. We could try to make price comparisons with other objects that cost 50 dollars and don’t offer you the same amount of engagement, but we’re genuinely struggling to think of something that’s even near this. Great for terrestrial viewing. The fact that it displays correctly oriented image makes the Celestron PowerSeeker 50 AZ Telescope one of the best Celestron telescopes for terrestrial viewing in its price range. Unambiguously an entry-level tool. Any experienced astronomer will probably quickly be bored with the Celestron PowerSeeker 50 AZ Refractor Telescope, since it is, despite its many qualities, a very basic tool that is sure to enchant beginners and give them the basic knowledge of how to work a telescope, but little else. Quite flimsy. To be able to sell a telescope for this sort of money you need to cut corners somewhere and it’s very clear that this was done through the use of cheap materials. Indeed, except for the glass lenses and the aluminum tripod, every other part of the telescope is made of plastic. The tripod is also not without its faults, being quite shaky at times. Where to Find the Celestron PowerSeeker 50 AZ Refractor Telescope? You can find Celestron PowerSeeker 50 AZ Refractor Telescope for sale on Amazon, for the very low price of $49.95. 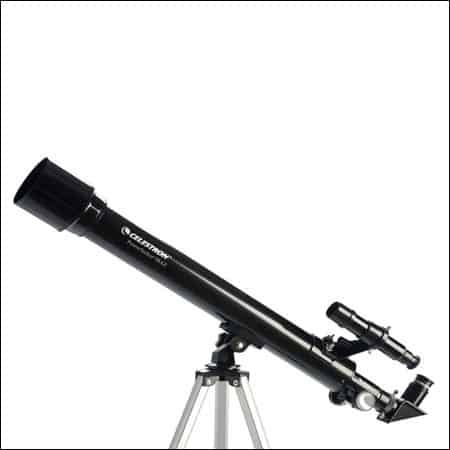 While not as sophisticated an item as its cousins, the Celestron PowerSeeker 60 AZ Refractor Telescope or the even more advanced Celestron PowerSeeker 80 EQ Refractor Telescope, the Celestron PowerSeeker 50 AZ Refractor Telescope price really puts this item in a league of its own. Being such a small and rather frail instrument, you should take extra care during use, storage and travel not to damage it. Wrapping the Celestron PowerSeeker 50 AZ Refractor Telescope in a soft material before placing it in any case is probably a good idea. 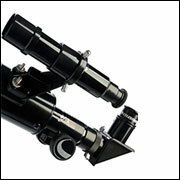 The Celestron PowerSeeker 50 AZ Refractor Telescope package comes with a finder scope, three eyepieces of 20mm, 12mm and 4mm respectively, a 3X Barlow lens and the TheSkyX – First Light Edition astronomy software. 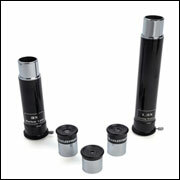 That’s a pretty impressive collection of telescope accessories for a such a cheap scope. The Celestron PowerSeeker 50 AZ Refractor Telescope carries a two year warranty from the producer, ensuring against production faults. Similar to the character of a fable, the smallest of the PowerSeeker telescopes is also the most honest. It’s very clear from the beginning that the Celestron PowerSeeker 50 AZ Refractor Telescope is an inexpensive, entry-level telescope that was made out of cheap materials. It’s also not very powerful, nor is it incredibly stable. But it wears its flaws on its sleeve, making it obvious that its role is not to be an expensive and high-quality tool for experts, but an object of wonder for beginners. Check any Celestron PowerSeeker 50 AZ Refractor Telescope review and you will find either disdain for a cheap product from those who already own several telescopes or pure amazement and gratitude from those who couldn’t care less about the quality of the plastic or the wobble of the tripod. What these latter group care about is what the Celestron PowerSeeker 50 AZ Refractor Telescope manual promises: with it, you can watch the stars. It’s far from being among the best telescopes in the world, but you can buy it for 50 bucks, point it at the sky without much effort and see Jupiter, and sometimes that’s really all you need.